Russia’s Foreign Minister Sergei Lavrov with Zimbabwe’s president Emmerson Mnangagwa. 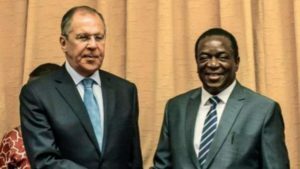 Russia will not interfere in Zimbabwe’s upcoming elections, Foreign Minister Sergei Lavrov promised during a visit to the country. Mr Lavrov made the promise as he revealed the two countires had signed deals on agriculture and mining, and were hoping to increase military cooperation and diamond mining in the future. Russia and Zimbabwe are already working together to exploit one of the largest platinum reserves in the world, just west of the capital, Harare. Mr Lavrov’s visit coincides with Washington’s decision to renew economic, travel and arms sanctions against Harare. Russia has maintained close political ties with Zimbabwe since the 1970s war of independence. But on this visit the minister also brought President Emmerson Mnangagwa a special message from Russia’s President Vladmir Putin: a promise to help stablilise the country, politically and economically. Mr Lavrov has now left for Ethiopia, where he is expected to meet African Union representatives.